…for turning so many of you into essential oil diffuser fanatics. 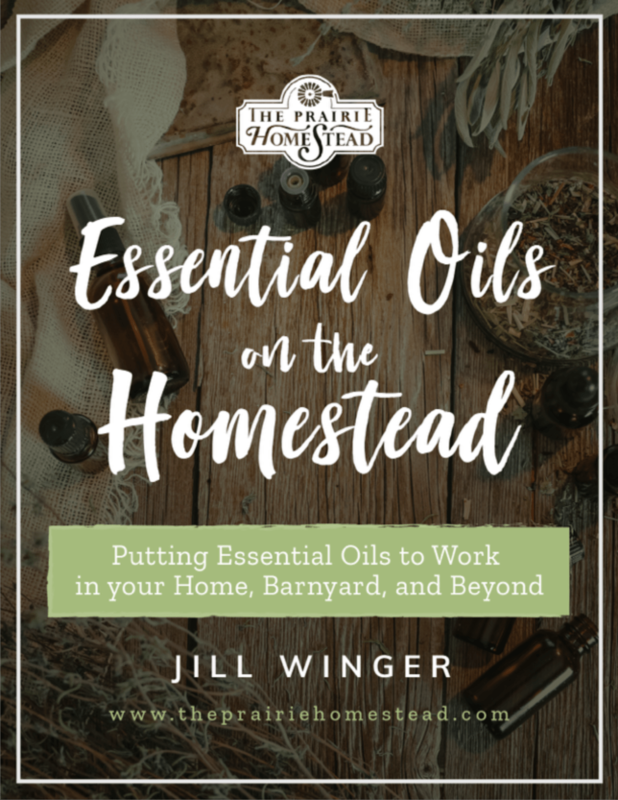 Believe it or not, two of the most popular posts to ever hit this homesteading blog have been about essential oil diffuser reviews and my 20 diffuser blend recipes. I think that’s awesome. I’m happy to oblige if y’all want to talk about diffusing oils in the midst of chatting about deep mulch gardening and making tallow soap. 😉 It’s all good. One of the first questions people ask after getting their first diffuser is, “Do I need to clean this thing?” Which is exactly what we’re gonna talk about today. Or sometimes they won’t be doing any of these things, but they’ll just be super gross and grimy on the inside. Fill the water reservoir half full, and add in 1/2 teaspoon white vinegar. 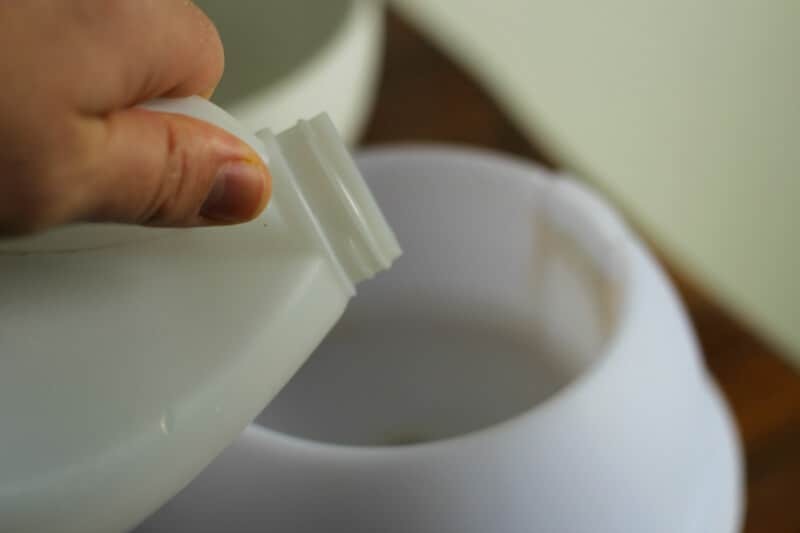 Run the diffuser for 5-10 minutes to allow the vinegar/water mixture to work through and loosen up the gunk. Turn off the diffuser, unplug it, and dump the water out. 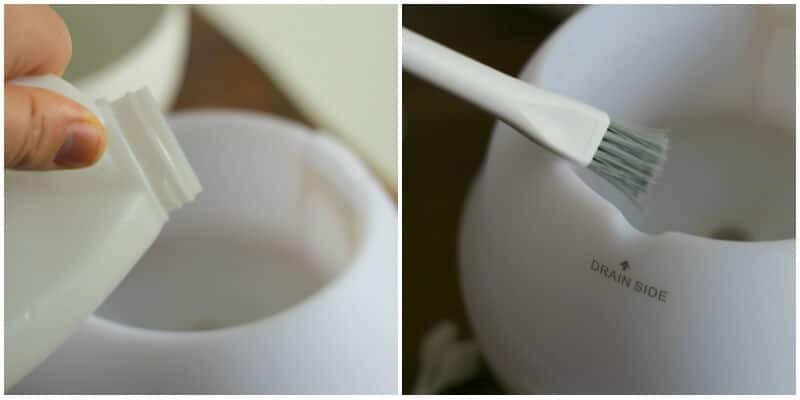 Then wipe out the inside of the diffuser with a soft cloth, q-tip, or small brush. Pay special attention to cleaning the sensor*, as these often cause the most issues when they get dirty. 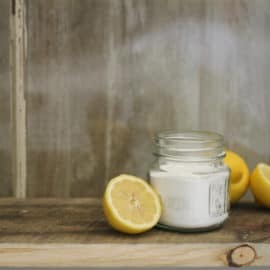 You can use a drop of lemon essential oil on your brush or q-tip if you need to cut through extra grime. *Depending on which diffuser you have, the location and appearance of your sensor will vary. Usually it’s somewhere in the water basin area. Check your owner’s booklet if you aren’t sure. Using a soft cloth, wipe down the outside of the machine to remove any fingerprints, smudges, etc. The cloth can be dampened with water, or you may lightly spray it with a bit of gentle cleaner or vinegar/water solution. Just be careful not to get excess water into the underside the machine. Now fill the diffuser with fresh water and your favorite blend and enjoy. This cleaning method is for diffusers that operate with water, not atomizing diffusers like this one (affiliate link). I have a whole bunch of different diffuser models in my house. Check out this post to see my reviews of each one. doTERRA is my essential oil company of choice, and I’ve used them for four years now. 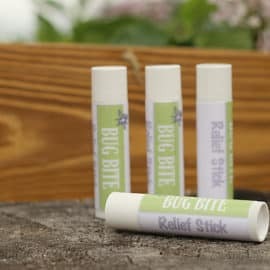 The oils are third-party tested for purity, ethically sourced around the globe, and I’m proud to be associated with a company with a heavy humanitarian focus who does things like funding Natural Doctors International trip so that people in Nicaragua could overcome viruses, infections, and many other health issues. I believe in this company wholeheartedly, and I’ve been sharing doTERRA oils with people non-stop since I started using them. I’m happy to personally help you get these oils in your home, too– click here to see how you can connect with me. “Super grimy and gross” — sounds like mine! I was just wondering that myself, about how to clean my diffuser. We have exceptionally hard water here and I don’t feel committed enough to my diffuse to buy distilled bottle water for it. I think I might go try it right away. I think tap water is actually better for diffusers, at least that is my understanding. We have incredibly hard well water as well, but I don’t use distilled water, either. A good cleaning should do wonders for it! My diffuser say to only use water to clean. I was using vinegar/ water occasionally and my diffuser stopped working after 7 months. I do not use it every day. How long should these motors last? My diffuser abd another that I bought for my daughter also stopped working and it was the same d?Terra model that is pictured here. The motor still runs but nothing is being diffused. Directions were followed precisely. Any suggestions? I had the same thing happen to my Doterra diffuser. Not happy with this expensive product! I recently had the same issue but it had been a while since I had used mine. I put some hot water in mine & let it sit overnight & it started working fine the next day. Hope this helps. We have a filter on our faucet that I use to fill my diffuser. I use distilled water. It doesn’t leave that hard to remove gunk. Thank you so very much!!! ?I will try this!!! I hope it works with the alcohol….. Vinegar sounds good also. How much do you use??? I’ve always had issue with the amount of vinegar I’ve used so this clears it up for me. Thanks! 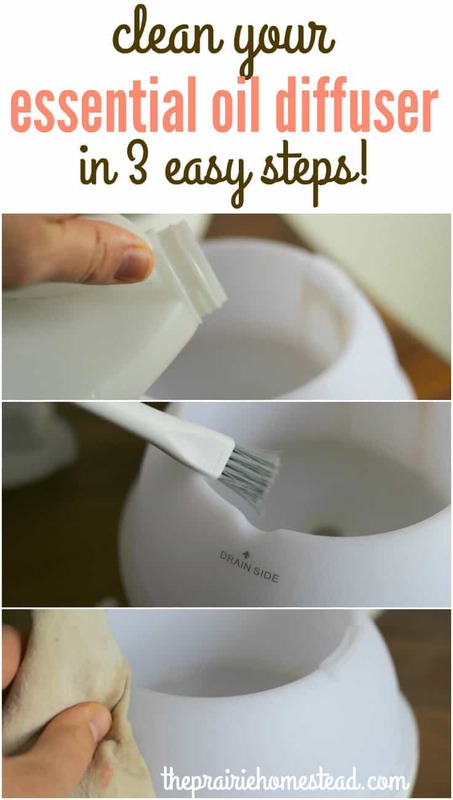 This is a timely post for me as I just purchased my first water diffuser. I went with the Aroma Lite by d?TERRA because I wanted something dependable. I’m sure there are other diffusers that are less expensive and work just fine, however, the added convenience of buying it on my monthly d?TERRA order won the day! I have 2 Aroma Lites and have been LOVING them. They run for so long and are super effective! Yes and if ordering monthly (LRP) you can use PV down the road to purchase your next diffuser! I have a RO water system, and use that water in my diffuser. I’ve had the diffuser for about two years and have not cleaned but a few times when I first got it (kinda following the manual till I realized I wasn’t really cleaning anything ). 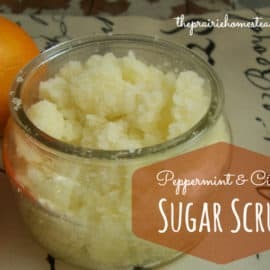 I use approximately two quarts a week in it. So that’s around 50 gallons of water that have been diffused through it. Interesting Steve! I never would have thought about trying that. Thanks for sharing! I simply wipe mine out with a paper towel each time, before I refill it. 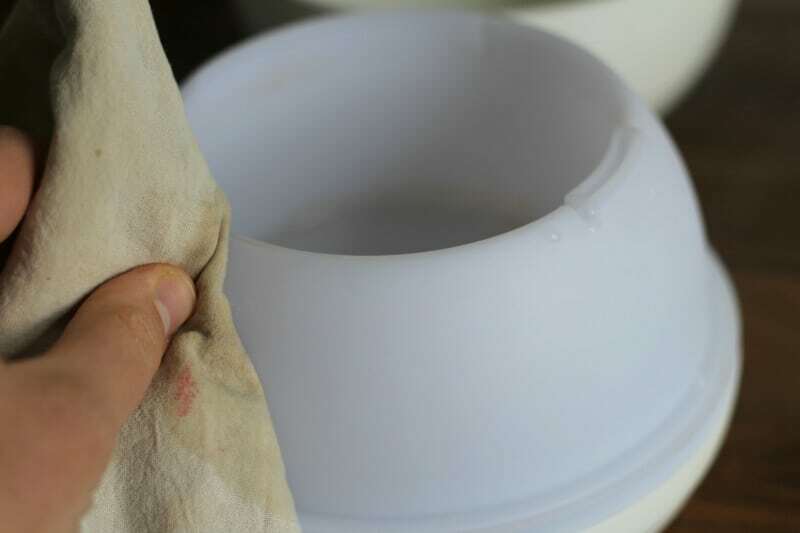 I make sure to carefully wipe off the ceramic disc in the bottom. When I do notice some build up, very rarely, I do the vinegar treatment. A lot of the issue comes with the oils you are diffusing. How much oil do you use??? I don’t have a diffuser yet,but will be buying one soon. Thanks ? for all the good news ?!!! I have a nebulizing essential oil diffuser from https://richaromas.com – The best way I figured out how to clean clog is medicinal alcohol, it is the most easy and effective way. I pour 25 ~30 drops of medicinal alcohol into the nebulizer and shake it slightly for a while until the remaining essential oil has been cleaned out, and then pour the alcohol out. Then plug the nebulizer into the base, and pour 20~25 drops of medicinal alcohol into the nebulizer again. Turn on the power of diffuser, and clog will be cleaned automatically after 5~10 minutes operation. WOW!!! I hope this works for me!!! Thanks ?!!! I have a diffuser and I filled it like usual with filtered water and my essential oil. The next morning I noticed it was still filled up. I tried it again and nothing comes out. Can I use apple cider vinegar to clean it out? I have reverse osmosis water. Should I use this instead of filtered water? Yes, ACV is fine. RO water is OK too. Thank you for replying back. I will try it and see if it in logs. Some of my diffusers say to not use citrus oils in them. Also some say not to used distilled water. I don’t use my tap water as I am on a well that has lots of iron and calcium. I buy gallon jugs of spring water. I usually get them for less than a dollar and a gallon typically will last me for a week. Using vinegar on any Young Living diffuser will VOID the warranty! Feel free to call and ask them….I found out the hard way. Ditto to what another commenter said… DO NOT use vinegar to clean your Young Living diffuser as it will void the warranty. I’m seeing some commenters on here saying their DoTERRA diffuser stopped working after they tried cleaning with vinegar (and running it with the vinegar/water mixture). All I do to clean mine is take a paper towel and some q-tips and a little rubbing alcohol, and just wipe out any oil residue or gunk. Then dry it out with a soft cloth or paper towel. I clean mine about once a week (or once every couple weeks at least). ? I have the Young Living Dew Diffuser and I clean mine out with a paper towel an alcohol poured on a paper towel not into the machine and as Lexi stated above dry it out with a paper towel. And to those of you out there that wonder if you need to clean it after every use NO you do not I never have! And it has always worked great never ever have had any problem whatsoever out of it ! I have used other diffusers and to me Young Living is the best! I have Young Living Diffusers and use Young Living Essential Oils. I use distilled water in them only and wipe them out. However, if they are looking dirtier I clean them by filling them with distilled water and using about 2 tablespoons of 100% Witch Hazel Solution and let it diffuse until it’s empty. That’s always worked great for me. I found after diffusing vetiver one day, I went to empty the excess water out and viola!!! My diffuser was freed of mineral deposits and residues left behind from past sessions. A nice short cut if you are lacking white vinegar. I am on a well so we have tons of minerals in our water. Great pin!! Thanks for sharing!! Love my doterra oils and love sharing them! I’ve never tried that! Good to know! Thanks! Tried cleaning with wipe before but never thought of running with vinegar. Will give it a try on my diffuses. Thanks!!! I just wanted to clarify, when you say fill the water reservoir, do you mean up to the full line? Or the whole diffuser? I love my diffuser and I don’t want to mess it up. Just to the full line. Is it ok to substitute White WINE Vinegar in place of the White vinegar? That’s what I have at my house right now & would prefer to avoid a trip to the store. I’m cleaning mine today and noticed that the motor/vent on the underside has some fuzzies in it. What would you suggest for cleaning this? My lid to my myrrh was off. I dumped a lot of it in diffuser. I’ve bent running vinegar and water and myrrh is still stuck to sides. Help??? Use alcohol (rubbing alcohol) and wipe it out with a clean paper towel. If it’s still “gummy” use some lemon oil (neat) on paper towel and keep wiping it up. I wouldn’t use vinegar. Unless your manual states to use vinegar to clean the diffuser- you’ll void the warranty. I really want to know how many diffusers you have – we all need goals to strive for, right? ?? I tried to clean mine with vinegar but there’s still no vapor coming out. I hear the motor running and the water inside is bubbling, but there’s no vapor. Any suggestions? I would check to make sure you didn’t over fill the diffuser. Make not to fill past the fill line. Good luck. It’s more than likely that your disc is expired or damaged. You can order another disc and replace it. I have ordered 2 from this company. Amazing service. and find your diffuser! He has videos to show you how to replace parts as well. Very simple and cheap! He is also wonderful to deal with. Amazing customer service! Note: YL recommendation is to use alcohol to clean your diffusers. Read your manuals. If you clean them any other way, you will void your warranty. Some oils are NOT meant to be diffused. If they are super thick, they will clog your diffusers. 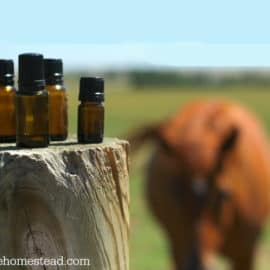 Vetiver oil is super thick and YL customer service does not recommend that you diffuse this oil. I have had issues with every YL diffuser I have. They have been replaced to no avail. I have very carefully followed their specific directions, and they still don’t work. However, thankfully, there are MANY other diffusers that DO work! YL wasn’t exactly interested in taking care of these diffusers either, but happily took my funds. Thank you so much! My diffuser is long overdue for a cleaning. I appreciate your clear instructions. We have 3 diffusers in our home. We clean them regularily with 1/2 white vinegar and 1/2 water (we use water from our faucet. We have our own well. We run it through a cycle – if it is still sticky, rubbing alcohol on a soft paper towel and q-tips will clean it up. We have had our diffusers for 3-4 years and use them all the time. The information here is inaccurate. I called Young Living about my diffuser and they said that vinegar is an abrasive and should never be used to clean a diffuser. They suggested a small amount of rubbing alcohol in the bottom, let it soak, then wipe away sediment. Do not use vinegar. Young Living will void warranty if you use vinegar in their diffuser. I’ve got to buy a diffuser so I can enjoy all my oils! Now I’ll know how to clean one! I was wondering about cleaning a diffuser that has been setting up for months and I did not clean it after the last use. Do you think it would be ok just to clean it with your 3 step process? 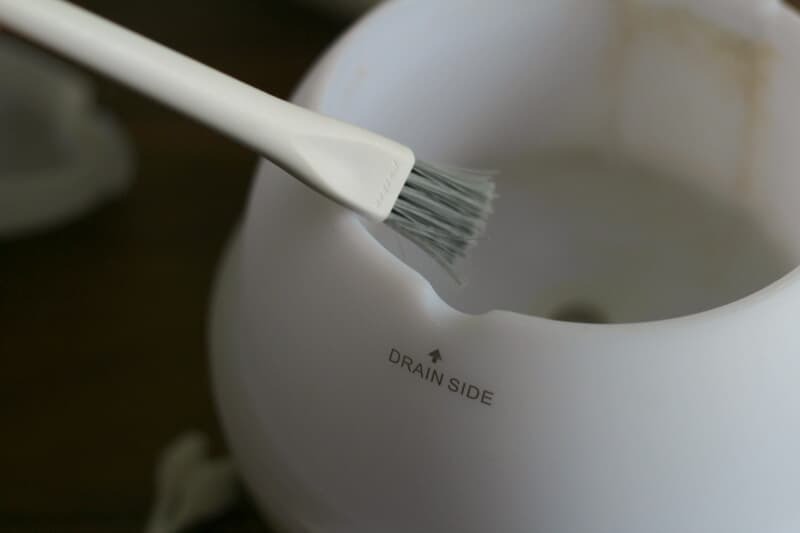 Hi Pam– I have had success with cleaning unused diffusers with this method. You may have to do it more than once, or let the cleaning solution sit in the diffuser for a bit longer, to give it the chance to work. It certainly can’t hurt to try.